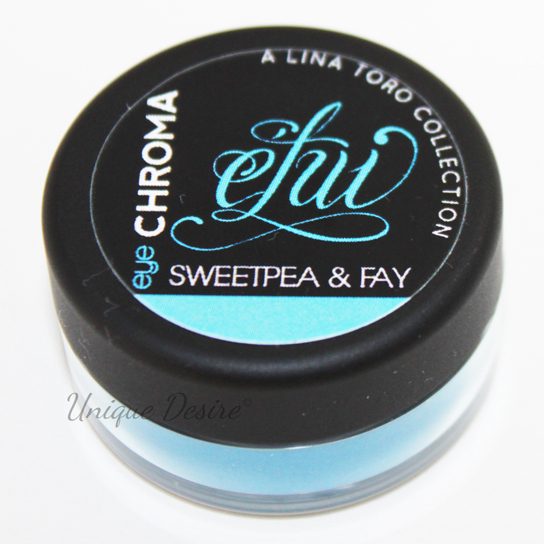 I was contacted by Sweetpea & Fay Cosmetics a few months ago to try out their new collection: Etui by Lina Toro. I took a look at the collection and fell in love with the Lip Joules. All the colors are so vibrant and gorgeous, so I said yes! My package took a few months to arrive but that was because they received a wave of orders right after they contacted me so my package was not their priority. But now that I finally have the package and I was able to try out the products, I have to say I really like them! I received two Lip Joules(Liquid Lipstick) and five Eye Chromas(eyeshadow). I feel these are gorgeous shades and very pigmented. They blended very well, better than most loose pigments. My favorite shades are Cytherea, Dive Bomber and Riding High. These lip Joules were my favorite out of everything I received. They are so pigmented and bright. Not blotchy at all, they are seriously Liquid Lipsticks. They are comparable to Sleeks Pout Paints but I feel these have a better formula. Best applied with a brush, not straight from the tube. This are a little bit more on the expensive side but I think that the Lip Joules are 100% worth it. Have you tried Sweetpea & Fay Cosmetics before? What did you think? What are your favorite colors? Leave a comment below and let me know! I like the shadows, I really like the swatch of the last one. Wow, love that blue lippie!